I LOVE oatmeal. Baked oatmeal. Steel-cut oatmeal. Instant oatmeal. Oatmeal with flax seeds. Oatmeal with berries. You get the picture. So, naturally, my interest was piqued when I began seeing recipes for “overnight oatmeal” pop up on Pinterest and among blogs I follow. A new take on oatmeal? One that can be enjoyed cold? I was officially intrigued. The verdict? I’m a fan. Overnight oatmeal can be eaten cold or warmed, but for me cold is the way to go because: 1. it’s easier that way (just pull out of the fridge, grab a spoon, and go) and 2. I like adding a cold option to the traditionally warm oatmeal line-up (it makes oatmeal sound much more appealing during the spring and summer months, which to me is a plus). Combine almond milk, oats, and jam in a mason jar and shake until well combined. Refrigerate overnight and top with blackberries before eating! 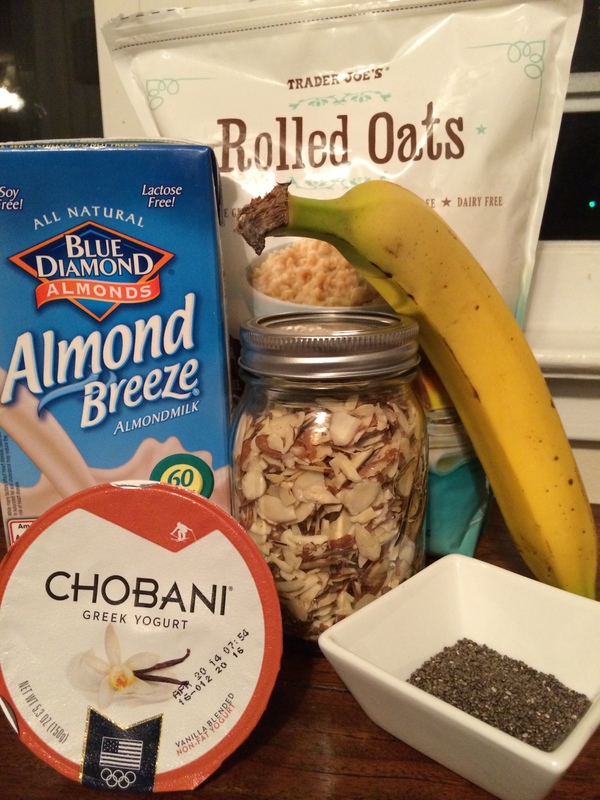 Place the oats, chia seeds, yogurt, and almond milk into a mason jar, put the lid on, seal, and shake to combine. Uncap, add the almonds, then fill the rest of the jar to the top with bananas. drizzle with honey and recap tightly. Shake to incorporate all the ingredients and refrigerate overnight. Combine all ingredients in a mason jar, seal, and shake vigoroursly until everything is thoroughly combined. Place in the fridge overnight. In the morning, eat cold (or warm up for 1-2 minutes in the microwave). Combine coconut milk, oats, and chia seeds in a mason jar, seal, and shake vigoroursly until everything is thoroughly combined. Place in the fridge overnight. Before enjoying, top with shredded coconut and chocolate chips. made the banana, honey, almond oatmeal last night for this morning and really liked it! Thanks for the recipe! I’ve been looking for a healthier alternative to instant oatmeal without the hassle of cooking steel cut oats and this is perfect!!!! So glad you liked it, Joe!